Cloud Save is a newly released extension for Google Chrome, which can upload images (or any type of files) from websites directly to different cloud services, such as, Picasa, Flcikr, Dropbox, CloudApp, Box.net, Min.us, Droplr, Posterous, and Twitpic. As the popularity of the cloud increases and many users begin to use it as their primary storage, it is time to start thinking of ways to save files directly to an online storage provider rather than downloading it first to the desktop and then uploading later. 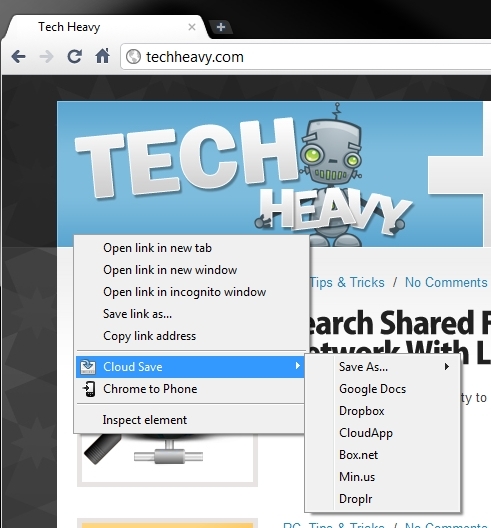 Cloud Save is a newly released extension for Google Chrome, which can upload images (or any type of files) from websites directly to different cloud services, such as, Picasa, Flcikr, Dropbox, CloudApp, Box.net, Min.us, Droplr, Posterous, and Twitpic. For files it only supports Dropbox, CloudApp, Box.net, Min.us, and Droplr. The extension is incredibly easy to use just right-click any image, link, or file, and select the online service from Cloud Save menu. 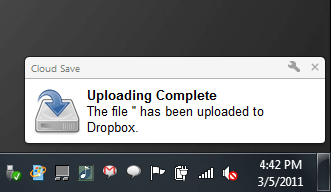 You will receive a desktop pop-up to notify you once files have finished uploading. Not only can Cloud Save do files and images but it can even handle the upload of HTML, PHP or a CSS file of a webpage to the cloud as well. Head over to the Google Chrome Extension gallery or get it here. I am also using Chrome aside from Firefox. This Chrome extension is amazing. We all know that we are storing files from time to time directly to our PC which can further clog the computer storage capacity, not to mention the risk of losing the files in one way or another. Downloading directly to an storage site can be a good alternative for many of us.